The Indiana Fever closed their morning workout before Game 4 of the WNBA Finals with a challenge. A half-court shooting challenge that left players wailing with chuckling as they junk talked each other. The Lynx unforeseen landed on the court a couple of minutes after the fact. Players traded their standard chat as they directed meetings. The state of mind around both groups could be best portrayed as free and loose, which would bode well if the event was a mid year pickup amusement. There was no insight of the strain that is enwrapped their title arrangement. "This is fun," Lynx mentor Cheryl Reeve noted. 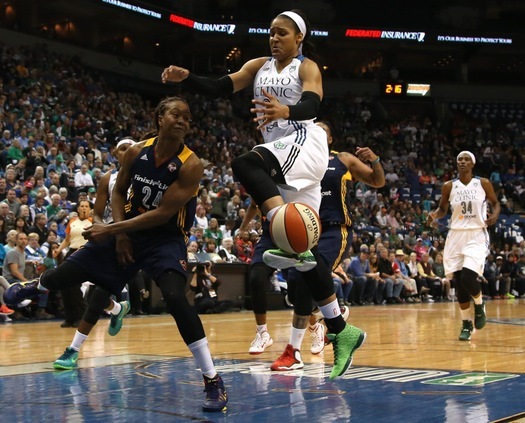 "It's both," Lynx star Maya Moore said. Fun, upsetting and about six different feelings fittingly characterize an even-Steven matchup that is presently come to an unequivocal Game 5 at Target Center on Wednesday. Another word to depict this arrangement: Compelling. Yes, all that much so. As a ball fan — not as a matter of course beyond words WNBA adherent but rather a sport's aficionado — this arrangement has inspired an emotional response and made me value the great presentation of top of the line ability and exertion by two groups that have drawn out the best in one another. Amusements 1-4 haven't been wire-to-wire perfect, yet the opposition is hellacious. They're thumping one another around like fun-mobiles. Anything great that happens is earned. "Everyone gets an opportunity to truly encounter WNBA ball at its finest," Lynx veteran Seimone Augustus said. "When you have encountered players — Olympians, players that contend at the largest amount each year — it makes for extraordinary b-ball." Both groups have encountered an array of feelings, a characterizing normal for any title arrangement worth hoisting above others. Nothing has come simple on the grounds that the groups appear to be as close as close gets. The Fever has scored 298 aggregate focuses in this arrangement. The Lynx have 295. The two sides then again have resembled the better group, and captivating story lines have encircled those back and forth movements. Reeve offered a sharp study of two of her most regarded veterans — Lindsay Whalen and Augustus — after Game 1. Fever mentor Stephanie White offered a sharp reprimand of the administering after Game 2. Moore propelled a three-point blade at the ringer in Game 3. The Fever played like a group frantic to maintain a strategic distance from disposal in Game 4. Amusement 5 entwines it all. "This has been a standout amongst the most energizing [Finals] in my memory," said ESPN investigator Rebecca Lobo, a Hall of Fame player who has been a group's piece since its commencement. "It's been the most aggressive in late memory without a doubt." That intensity serves as the best commercial for an alliance as yet endeavoring to develop its image. Reeve has utilized the expression "eyes on our item" a few times, aware of a potential (and confident) progressively outstretching influence from an engrossing arrangement. Whether ladies' b-ball gets any skip in consideration from this showcase stays questionable, however that is truly not the point here. In a smaller perspective, we can welcome this arrangement for what it is — b-ball being played at an abnormal state. "It's certainly been a fun arrangement for individuals to watch and for us to play in," Moore said. The arrangement has highlighted the best player in the game (Moore), one of ladies' b-ball's most prominent ministers (Tamika Catchings) and a large group of players who might be champions on any group. "There have been years where perhaps you've had two [elite] players and the rest sort of part [players]," Reeve said. "Presently? Gee golly." That profundity in ability is a development's impression of the game at youth levels. Quality preparing, higher support numbers and AAU ball have filled an upward stream of better ability. "As far as the athletic capacity, there are better competitors on the court now," Lobo said. "Furthermore, by and large, they're more talented in light of the fact that they began playing more youthful. Each player in this group viewed the WNBA from the time they were a child on." The cutting edge holding up in the wings has been dealt with to a top of the line title arrangement. Same goes for every one of us. Two glad groups have shown much persistence in their mission for a title, with a victor take-all amusement left to settle their score. The champagne will taste forceful fine to the group left holding a trophy.